If you are a student of a college or university, you should understand the significance of knowledge. However, even if you’ve reviewed lots of information on this particular subject, it doesn’t automatically make you a good student or scientist. The method of thinking also matters and gives you more advantages than just learning facts. Why Are Critical Thinking Skills Important For Students? You can read a lot of different books and remember what you have learned but you can’t apply your knowledge in practice if you can’t think critically. Such skills allow you to analyze the information you have and apply it as you need. You can interpolate your knowledge in other fields that you are not familiar with. If you operate with bare facts, you can do ordinary things that were already done by other people. 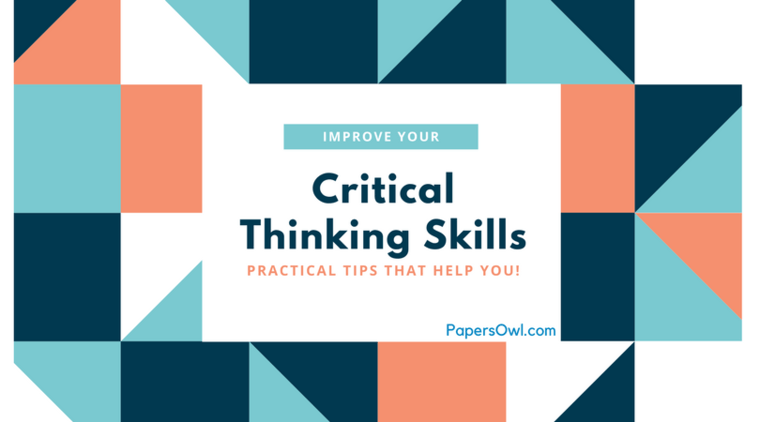 If you know how to critically think, you can generate new concepts and make your contribution to science, politics, economics, math, and other fields. That is why you should develop critical thinking skills if you are going to be a good student. You also need to understand how to think critically to write different academic papers. There is usually a section named Conclusion, where you can analyze the information you have and offer your opinion. To write it, you have to demonstrate your analytical and critical thinking skills. Whether you use an online essay writing service or not, you have to improve these skills while studying in order to have higher chances to succeed in the future. People often manipulate or misinform other people. If you believe everything people say and every fact that you read in newspapers, it can mislead you and make you a victim of the fake information. What does it mean? It means that you will need an ability to think critically even after graduation because it is crucial for protection against fraud. It’s false to believe that people are born with such skills and can’t develop them. You can work on improving them and it makes you think more clearly. You can also use these tips for it. What other questions may I ask later? There can be different questions, depending on what you need to get. To develop critical skills, you should learn to ask the right questions and find proper ways to answer them correctly. When reading essays of other people or using a critical thinking writing service, you may notice that people analyze similar information in different ways because they have different perspectives. This explains why there are scientists who disagree with other scientists even if their opinions are based only on facts. From birth, we approach things in a similar way we’re used to. However, if you are striving to get a good education at a university or college, you have to learn to evaluate different matters from other points of view. What do other people say about a specific person or object and why do they do it? What makes them think this way and how does it affects what they do? You may ask these questions to expand your viewpoint and notice things that you have not noticed earlier. To understand the way other people think, you need to understand their background. Of course, reading allows you to relax, learn more facts, or gather information for your project, but it also helps you develop your skills. With any book you read, even if it is a fictional story or a novel that isn’t connected with your subject, you learn to see things from varying perspectives. Most good books contain ideas that make you evaluate them. Even if authors don’t give you answers to questions they ask, it makes you looking for them and establish your own assumptions and deductions. It is an important component in education. That is why most children in the world learn classic literature at school and many of them keep reading much after graduating. You may learn critical thinking in college but it is also crucial outside the walls of your university. Why do you need this? It helps you avoid deception, make correct conclusions, process information wisely, and get other benefits. That is why you have to learn to think critically not only when you’re working on debate topics for students or other university projects. Looking at a problem from different points of view is also crucial. To develop such skills, you should cooperate with other people and read good books, even if they are science fiction. Except for reading, you also need critical thinking practice and you can get it by writing different papers when working on projects.